When houses are flattened, towns submerged, and people stranded without electricity or even food, we attribute the suffering to “natural disasters” or “acts of God.” But what if they’re neither? What if we, as a society, are bringing these catastrophes on ourselves? That’s the provocative theory of Catastrophe in the Making, the first book to recognize Hurricane Katrina not as a “perfect storm,” but a tragedy of our own making—and one that could become commonplace. The authors, one a longtime New Orleans resident, argue that breached levees and sloppy emergency response are just the most obvious examples of government failure. The true problem is more deeply rooted and insidious, and stretches far beyond the Gulf Coast. Based on the false promise of widespread prosperity, communities across the U.S. have embraced all brands of “economic development” at all costs. In Louisiana, that meant development interests turning wetlands into shipping lanes. By replacing a natural buffer against storm surges with a 75-mile long, obsolete canal that cost hundreds of millions of dollars, they guided the hurricane into the heart of New Orleans and adjacent communities. The authors reveal why, despite their geographic differences, California and Missouri are building—quite literally—toward similar destruction. Too often, the U.S. “growth machine” generates wealth for a few and misery for many. Drawing lessons from the most expensive “natural” disaster in American history, Catastrophe in the Making shows why thoughtless development comes at a price we can ill afford. "Fabulous. I am amazed at the quality of writing—it often left me breathless—and the depth of analysis. This penetrating and engaging book is essential for understanding the many catastrophes that stem from ignoring nature in our quest for economic growth." Charles Perrow, Professor Emeritus, Yale and author of "Normal Accidents"
"This brilliant work demonstrates once again that most 'natural' disasters are in fact man-made, and therefore preventable and correctable. Bravo!" "The best account yet of why the levees failed. The authors also warn of more disasters to come if politicians and government agencies continue to promote huge engineering projects along unstable coastlines." 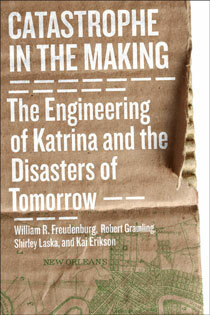 "This masterpiece of scholarship breaks through a clutter of explanations of Hurricane Katrina...Freudenburg and his colleagues ground their analysis in an enduring sociological concept of the 'growth machine'... to advance their argument of humans' biting nature...Essential...Highly recommended." "From backgrounds primarily in sociology or environmental studies, the authors do an excellent job explaining their treatise, providing a comprehensive background on the hurricane itself—how and why it formed, the physical processes at work, and how once the storm passed the disaster started. Discussing deeper stories not widely reported in the media, they highlight the heroics of the 'Cajun Flotilla' and other inventive survivors, and create a backdrop for a better understanding of the human cost associated with the storm and subsequent tragedy." Chapter 5. A "Helpful Explosion"
Chapter 8. Critical for Economic Survival? Chapter 10. The End of an Error? What will happen when thousands of people overwhelm communities? Climate change is mostly a “slow onset” phenomenon. It does, however, generate fast-onset disasters/catastrophes as well. Multiple years of drought slowly debilitate the ecosystem, threaten crops growth and healthy forests that absorb rain when it comes. Wildfires fed by dead/dying plant growth destroy communities rapidly, thus leading to soil poised to contribute to mud slides, etc., etc. The rhythm of the unexperienced and destructive dynamics of climate change play themselves out. Similarly, human response will be both slow onset and rapid, interacting with one another. The Louisiana Native American tribe of Isle de Jean Charles Biloxi/Chitamacha/Choctaw living on the fragile remaining land of coastal Louisiana has gone through these same “rhythms.” Their experiences give us more indication of what the climate change impacted human communities will experience. With the waves of hurricanes that have struck the now tiny, mostly submerged island community, some tribal members, families, have left the island because the damage to their homes was too extensive, they were unable to afford repair or the challenges to get themselves and their children to and from the mainland to work and school proved too challenging. This slow-onset out migration has reached a point at which the next step will be removal of the remaining tribal residents in one step of resettlement. The community, of strong Christian faith, pray that the resettlement is rapid and precedes another destructive hurricane event. Last January they received, as part of the application by the state of Louisiana to the U.S. Dept. of Housing and Urban Development National Disaster Resiliency Competition (NDRC), $52 million to resettle those remaining and to regather with them into the same new resettlement those who had already left in the earlier storm diasporas. The resettlement, some significant distance inland–perhaps up to 40 miles–will be a model community of best resilient practices as more and more small coastal communities along all three U.S. coasts confront sea level rise and need to imagine how migration inland can best be accomplished. No sooner does the issue of resettlement (full communities) or relocation (individual families/households/neighborhoods) come to the fore of our thinking than the next questions must be answered: Where are they going? Will the new ecosystem be foreign to them and resistant to their traditional ways of earning a living, including coastal wildlife and seafood harvesting? Can those who move prepare themselves in advance, that is gain in resiliency in place that they can apply in their move? Will the receiving communities be welcoming? Will they be able to provide the housing and all requisite community services for them? Some 100,000 African Americans were driven from New Orleans by Katrina, not to return. Many (estimated 40,000) settled in Houston and environs. How did the City accommodate them? Was it a successful relocation? Answers to these question are sparse, a missing effort that will be most noticed when the next large coastal diaspora occurs and inadequate knowledge has been accumulated to guide the outcome. The lesson is very clear: not only must at-risk communities to climate change commit resources to adaptation to it, but likely receivers of residents from them, communities inland, communities in better geographies should be anticipating and preparing for receipt of the internal migrants. Sadly, Louisiana is the locus of not only an anticipated successful resettlement but a failed one as well: residents of New Orleans and coastal Louisiana whose homes were destroyed by Hurricane Katrina moved inland to communities along bayous on either side of Interstate-10 that were inundated by the August, 2016 31-inch rainfall catastrophe (160.000 homes flooded). The case of these Louisianans twice severely impacted clearly suggests that successful relocation requires very careful study when it occurs and refinement of best practices for future successes. Are we prepared to think so precisely in light our usual way of considering these as unexpected events that will just play themselves out? The lesson is the same as the one we advise for anything related to climate change: anticipate, investigate, refine, acknowledge best practices and be committed to implementing them. No less is required for relocation engendered by climate change. Shirley Laska, PhD is Professor Emerita of Sociology, University of New Orleans; founding past director of UNO-CHART–Center for Hazards Assessment, Response and Technology; co-founder of the Lowlander Center and co-author of Catastrophe in the Making with William Freudenburg, Bob Gramling and Kai Erikson.